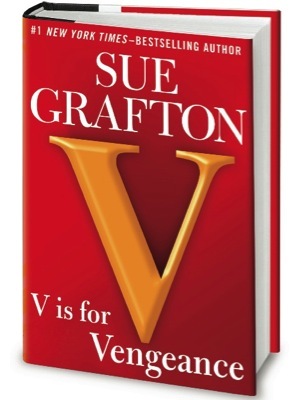 Sue Grafton recently announced on her Facebook page that the 22nd book in her bestselling Alphabet series is titled V is for Vengeance. Kinsey Millhone will make her return on November 21, 2011. Grafton’s publisher has even released a promo video for V is for Vengeance. Check it out below. A woman with a murky past kills herself—or was it murder? A dying old man cared for by the son he pummeled mercilessly. A lovely woman whose life is about to splinter into a thousand fragments. A professional shoplifting ring racking up millions in stolen goods. A brutal and unscrupulous gangster. A wandering husband, rich and powerful. A spoiled kid awash in gambling debt thinking he can beat the system. A lonely widower mourning the death of his lover, desperate for answers that may be worse than the pain of his loss. An elegant but ruthless businessman whose dealings are definitely outside the law: the spider at the center of the web. And Kinsey Millhone, whose thirty-eighth birthday gift is a punch in the face that leaves her with two black eyes and a busted nose. Can I just say that I’m crazy excited for V is for Vengeance? Now I just have to wait until November.